Annapurna Circuit treks are an amazing way to see Nepal, giving access to remote and fascinating places. This is especially true at Muktinath, a sacred site on Annapurna Circuit treks with great religious and spiritual significance to both Hindus and Buddhists. 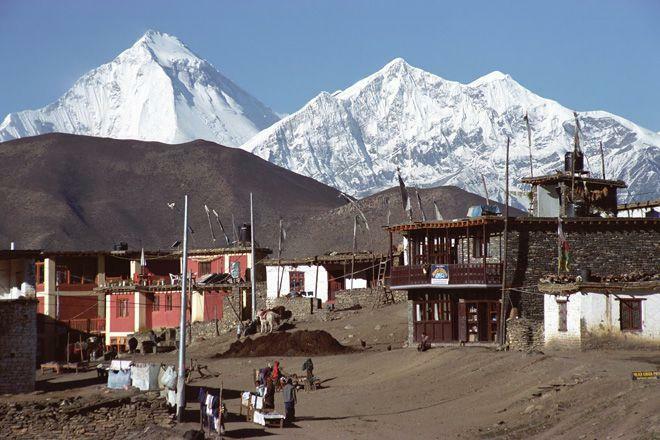 Muktinath is called Mukti Kshetra – “place of salvation” – by Hindus, while Buddhists know it as Chumig Gyatsa, which means “Hundred Waters”. The small central temple, Sri Muktinath, is one of the eight most sacred shrines for Hindu Vaishnavas and one of the oldest Hindu temples for the god Vishnu. The temple’s gold murti (a term used by Hindus to denote a representation of a divinity, typically made from stone, wood or metal, through which the divinity is worshipped) is recognised by Buddhists to be a manifestation of the Bodhisattva Avalokitesvara. The temple is traditionally cared for by Buddhist nuns of the lineage of Lama Wangyal and it is a site of great significance. The founder of Tibetan Buddhism, Guru Rinpoche, is said to have stopped at Muktinath and meditated. For people on Annapurna Circuit treks, Muktinath is therefore an excellent opportunity to see a place where Hinduism and Buddhism overlap and co-exist. The nearby Kali Gandaki River is a source of black ammonite fossils, known as saligrams, which are considered holy emblems and worshipped as manifestations of Vishnu. The area is also said to be the only place in the world where all five elements – fire, water, sky, earth and air – can be found in their distinct forms. Annapurna Circuit treks take visitors alongside pilgrims to one of the most important religious sites in the Himalayas. They can see the temple, rest in the nearby village and, of course, enjoy the beautiful surrounds of the Annapurna Circuit.